Powerful yet intangible, a brand is the personification of your organization. Learn to build, nurture, and grow a strong brand that inspires people, forges emotional bonds, and moves customers to insist on buying your brand. This book guides you through the entire branding process, from using social media effectively to linking your brand to human needs. The selected excerpt is “Chapter 8: Driving the Consumer from Brand Awareness to Brand Insistence”. 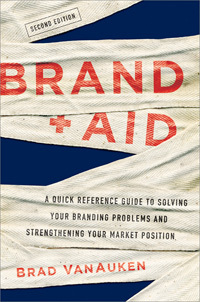 Brand Aid: A Quick Reference Guide to Solving Your Branding Problems and Strengthening Your Market Position, 2nd Edition, by Brad VanAuken. Published by AMACOM Books, excerpted with permission. Copyright © 2015 Brad VanAuken. All rights reserved. "I can honestly say that I learned more in 30 minutes than I learned in 8 weeks of this marketing course."